Happy Thai Times!!! Sawadee !!! The last day before we left, we went on a day trip to one of the largest floating market in Thailand, Damnoen Saduak floating market. The Damnoen Saduak Floating Market is located at Damnoen Saduak District, Ratchaburi Province, about 105 kms from Bangkok. The market is a labyrinth of narrow canals packed with paddle boats and floating farmers in traditional dress selling everything from fresh fruit and veg to steaming hot noodles over burning fires. We enjoyed coconut drink here. Fruits and vegetables are fully loaded on several small boats for sale to visitors. These kind of photographs are among the most often published in flight magazines and travel brochures of Thailand. 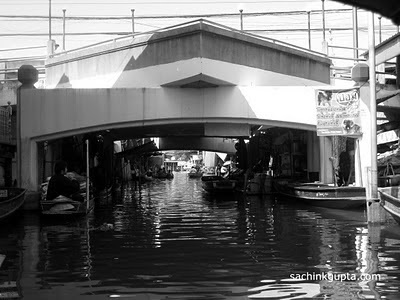 One can easily see how it gets its nickname of Venice of the East. 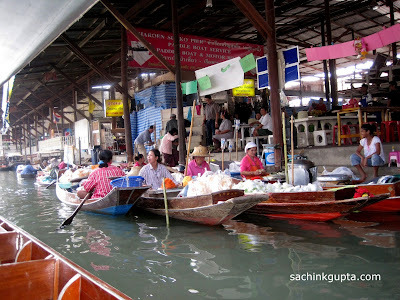 We also see traditional Thai houses, the way they live and travel by boats, and please try riding on a small boat to experience the floating market and to see more. This was a worthwhile 1 hour trip. Although it was quite pricey and a little touristy, it was still interesting to see how this community lives. Fruits, snacks, hats, T-shirts, vegetables, silk dress, toys, you try anything, you will get here. Next destination was elephant village, that was very nearby to floating market taxi stand. Our driver drop us at the parking place of elephant village at Ratchaburi itself. 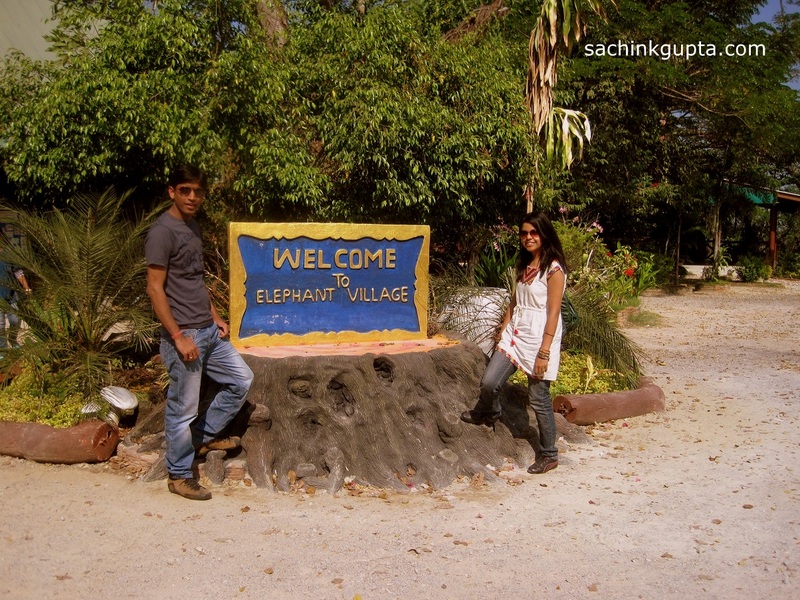 We drop baby elephant show and choose elephant ride for approx 45 mins in the jungles and in the water, as we have to catch-up our flight. We also bought some bananas and feed those to the elephants. The elephant was walking on a predefined path. In the way, mahout (elephant driver) also showed us different kind of necklaces and neck-pieces made up of elephant teeth. After that we came to our hotel just to check-out and back to Bangkok airport. Here we have the surprise, our flight pre-pone by 3 hours and we missed it. Thankfully airlines provided us next day boarding passes and hotel accommodations. At this time all we could do was laugh. And so, after a few days that were filled with lots of adventure, fun and some rather interesting experiences, we packed our bags and finally headed back to Delhi (India). At the Suvarnabhumi Airport - Bangkok, The scene of the churning of The Milk Ocean was beautifully portrayed. We bring some different kind of souvenirs from different parts of Thailand, wherever we visited. and At the end we bought some Thai snacks and sweets from the airport as well. Coral Island Tour with undersea walk at Pattaya. 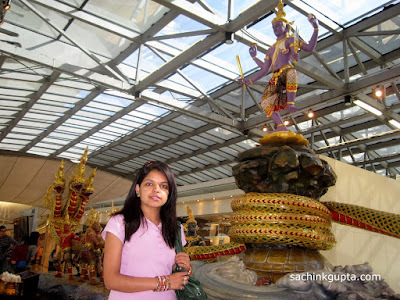 Sanctuary of Truth, Mini Siam, and Tiffany Show in a day at Pattaya. 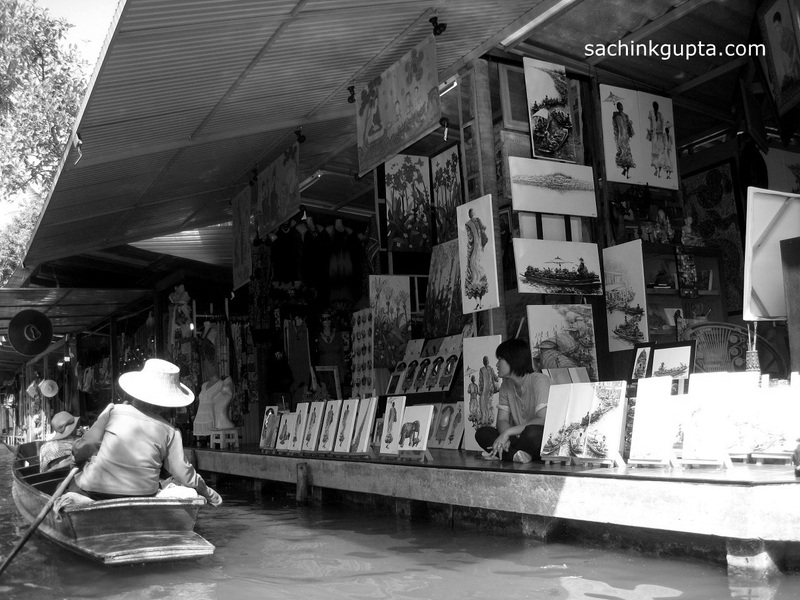 It was around 700 THB at that time from Bangkok, and boat trip was 300 THB in the Saduak market. 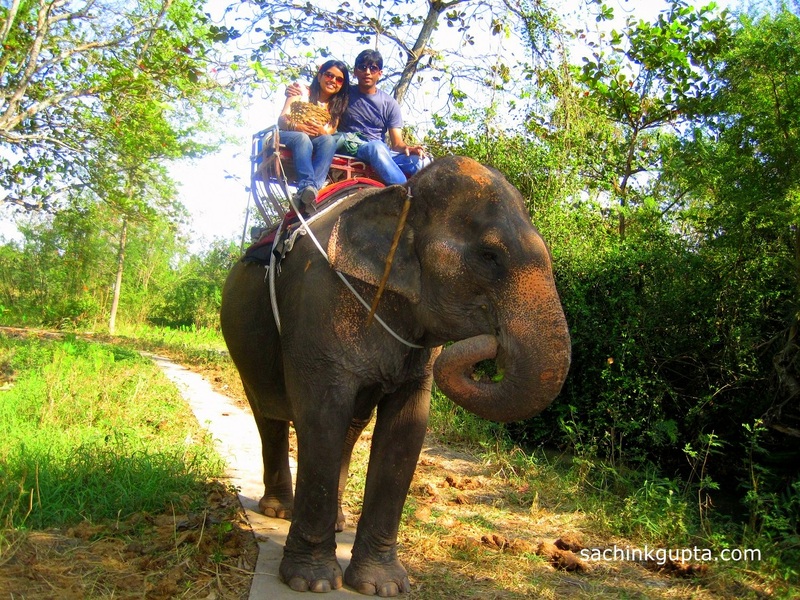 Elephant ride you can bargain and this is also based on how much time you want to do the ride. 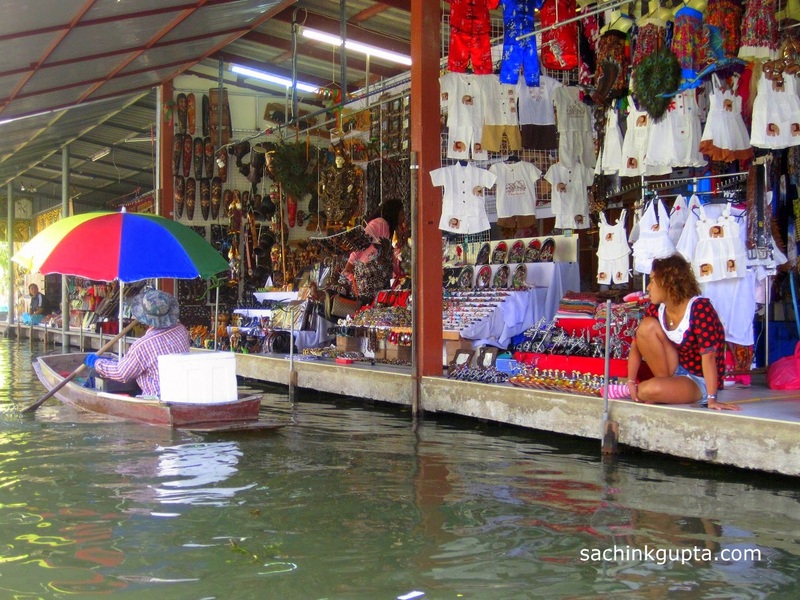 Hi, did you get tour guide for the floating market plus elephant village? I want to ask who was your tour guide/travel agent, or how did you go to these places? Some of the research about these places before going helped me a lot. Once you finalized the place, you can select any agent there, let go and enjoy the place. A couple of tourists were at an elephant village in Thailand when they allegedly caught the physical abuse of a three-year-old baby elephant on film. A staff member at Damnoen Saduak Elephant Village is seen in the video approaching the poor calf in a threatening manner with his fist raised. When the calf cowers away in fear, the cruel man jerks its ear, sending the animal to the ground shrieking in pain. He then kicks the elephant’s foot and chained it up. The sickening, proud smile the abuser displays afterward shows that this cruel behavior is not frowned upon at the village. The elephant’s instant reaction of fear when the aggressive man first approaches the animal speaks volumes. It’s clear the elephant is familiar with aggressive, threatening, and abusive handling. The threat of his fist alone should be enough to have him fired and charged with animal abuse. Since the elephant is clearly suffering physical abuse by the staff, the entire elephant village should be shut down. It’s bad enough the elephants are forced to survive in unhealthy, closed quarters. There’s no excuse for this deplorable display of cruelty to an innocent animal.